"Ralph was an unusual mouse. He had listened to so many children and watched so much television that he had learned to talk. Not everyone could understand him. Those who could were lonely children who shared Ralph's interest in fast cars and motorcycles and who took the trouble to listen." Unexpected blessing of parenthood: experiencing things again through the eyes of my children. It shouldn't be unexpected, but I guess we all know by now that my ability to be forward-thinking only extends as far as my worry will carry me. It generally does not include the expectation of great things happening. I'll agree that "seeing things through their eyes" is one of those cliches of parenthood that pre-baby me heard and went yeah, yeah, sure. Now let's talk about how smart/cute/beautiful/awesome my child will be. It just didn't occur to me to imagine myself getting all excited about Disney Princesses, or jump rope, or episodes of Duck Tales again. I'd been there, done that, man. The first time we went to Disneyland and Ad was big enough to get it, I cried. Like a big freaking loser. My love of Disneyland notwithstanding, it was mostly because seeing it through Ad's eyes was just about as good an experience as I'd ever had. Having kids gives you permission to think all that kid stuff is exciting and fun and magical, anyway. A recent example of my inability to control my emotion relates to Ad's new found love of big kid books. I like Curious George as much as the next guy, but my kids never seemed to dig the really cool board books that I wanted them to like. There was this one summer (yes, summer) where all Ad wanted me to read to her was this crappy Animals of Christmas book. I mean, if you went to a yard sale and saw this book, you would not buy it for 25 cents. You would keep walking and look for something less insipid and poorly rhymed. (Crappy writing in board books slays me. How hard is it to rhyme if the book is one paragraph long? Don't repeat yourself, cheater!) Gus made sure its physicality matched its content, in terms of desirability, by autographing the front cover with some wicked tooth marks. This book, if it would have even been one ounce of awesome, would have been killed anyway because my little Roo wanted to read it all the freaking time. Mommy, read it again. There are plenty of wonderful kids books. If You Give a Mouse a Cookie, Goodnight Moon, The Very Hungry Caterpillar, Blueberries for Sal, The Velveteen Rabbit (most touching gift I ever received, by the way), Snuggle Puppy... but when your kid reaches for the same five books over and over again, you pray for change. There's a long stretch of time from when you get your first five obligatory copies of I'll Love You Forever at the baby shower (by the way, I know I'm outing myself here, but that book gives me the heeby jeebies) and when you finally get to move on to real people books with your kid. You love those first books for a while, but then you're ready to move on. You read them, because you love your kids and you hope that in the act of reading Winnie the Pooh and the Blustery Day for the eight hundredth time, you're getting level-ups as a parent and one day your kid won't be a dummy. So you wait. And you wait. And you pray that your kid has an awesome teacher because even though you think you're pretty smart, you are about as clueless about teaching her how to read as you are about installing a ceiling fan. But this year is the year, Man... Dude... Sorry. I'm on a surfer nickname kick tonight. Bro. Maybe you saw this poem--I'm glad I posted it here, because I know the exact day that Ad started reading "chapter books" to herself. I found her reading on the couch, and she said "Mom! I don't need pictures anymore! And I can read it to myself in my head!" Do you guys feel me oozing nerd pride? My geek is showing, and I don't care. You go, Ad. Reading is an amazing thing, and so is Elementary school. I can't do what those people do there. I don't even try to pretend I can. I thought I was so teacher-mom, having her count and sound out letters and sing and read... then she came home from her first day of Kindergarten knowing more than I did by 6th grade. Oh well. She's flying now, she's reading voraciously, and it's opening up this whole new crop of books for me. Again. We've moved up a level; a whole new world is open for us to share. Don't you dare close your eyes. Hold your breath, it gets better. I've been hunting for this one in particular. Mr. Helms read it to me in first grade, and I remember sitting on the floor listening, wanting to read it myself. It lit a fire inside of me, wanting to be able to look at the page and make the story come alive like he did... craving books... wanting to "get" to read the next one... Not many of the kids I teach are excited when they "get" to read a book. They use other words. Scary words. They lack imagination, but they make up for it with a vocabulary that is, as Vivian Bearing would say, decidedly Anglo-Saxon. 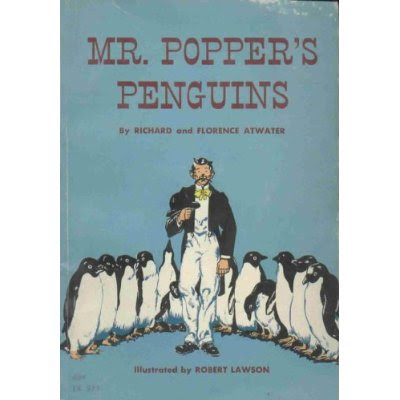 Here's the book: Mr. Popper's Penguins, by Richard Atwater. Last night at Borders, the search for this little gem (found it!) led me to another one from that year: another spark to the fire. Ralph S. Mouse. First grade was huge for me. I have to tell you, I have glee right now. Glee, I tell you. I'm not really one for glee, generally. I just finished reading the first chapter of Ralph S. Mouse to the monkeys before bed. And I loved it. I loved it right along with Hank as he laughed about the tiny motorcycle, and I loved it right along with Ad as she sat on the edge of her bed, waiting to hear what happens next. Ralph S. Geez. I haven't given a single thought to these books in eons. But the glee remains. Mr. Poppers Penguins, Ralph S. Mouse, The Lion, the Witch, and The Wardrobe... these are the books that changed my life. Not King Lear. Okay, King Lear too. And Beowulf. But these old friends hold just as much of an honored place in the library of my heart. And I get to share them with Roo and Bud. Bliss, I tell you. I am prone to serious nostalgia. My little ones are still into the picture books, but my heart nearly melted into my shoes the first time T read "Brown Bear, Brown Bear" to me! OOOOH SOOO PROUD MOMENT AS A MOM!! !